In order to convince potential buyers that the minuscule Smart ForTwo isn't something they will be violently killed in, Smart has long trumpeted the car's "tridion safety cell" as being one of the most protective systems out there. But how does it hold up in a Mercedes-style David vs. Goliath crash test? 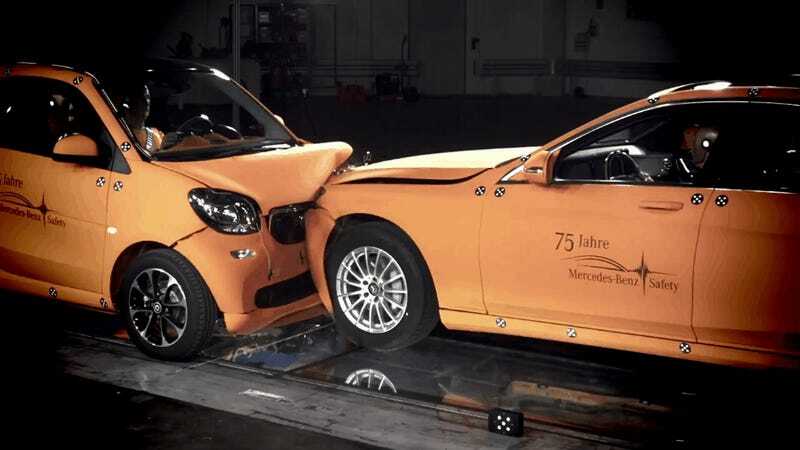 Mercedes says they like to focus on the compatibility of vehicles from different sizes and weights in their car-to-car crash tests. So in one corner, we have the Mercedes S-Class sedan, a hulking luxobeast and one of the safest cars on the road. In the other, we have the tiny 2016 Smart ForTwo. The S-Class has nearly double the weight on the Smart. So how'd it do? Surprisingly well, actually. The passenger compartment remained intact thanks to that tridion cell. It passed the test at Daimler; we'll see how it does in official American and European crash testing.